The 13th annual Schoharie Watershed Summit is scheduled for Saturday, April 27th, 2019 at the Windham Mountain Resort. This year's morning presentations are focused on Digging Deeper: Understanding how geology affects the Schoharie Basin. The presentations will take the audience on a journey through geologic history, focusing on both bedrock and glacial geology, and concluding with information about how the geology affects modern streams and our stream management strategies. Afternoon workshops may count towards municipal credits. For more information about the morning presentations and afternoon workshops, click here. New venue this year! This FREE event will take place at the Windham Mountain Resort on Saturday, April 27th, 2019 from 9:00am-2:30pm. Come early! Doors open at 8:00am for sign-ins, networking, and morning refreshments. All registered attendees will receive free morning refreshments and lunch (please indicate if you are staying for the buffet lunch during online registration). Join us for a guided photography walk with Francis X. Driscoll along the Westkill Stream in the Spruceton Valley area of Lexington. Fran will show how he has gotten some of his award-winning shots. This will include hands-on instruction, in the field, with camera settings, composition, exposure, depth of field, etc. With emphasis on enjoying and capturing the beauty around us. Participants will meet at the West Kill Community Hall to carpool to the location, as parking space is limited at the trailhead. The photography walk will wrap up around noon and then carpool back. This is an outdoor event, so attendees should dress for the weather, bring a filled water bottle and snacks, and wear appropriate footwear for walking on a trail. All camera types, including cell phones and tablets, are welcome. In the event of rain or other inclement weather, this event will be postponed until Sunday, May 12th, and registered attendees will be notified by e-mail. This is a Schoharie Watershed Month event. Click here to view the event flyer. Registration required by Thursday, May 2nd. Space limited. We used to say “it rained.” Now we refer to “rain events.” We’ve all seen wet weather cause erosion and flooding. Through a slide presentation and guided walk, author and landscape designer Carolyn Summers will present information on ways to harness wet weather to beautify landscapes, create better wildlife habitat, and prevent erosion. This is a Schoharie Watershed Month event. Click here to view the event flyer. Join Larry Federman, president of the Northern Catskills Audubon Society and former Education Coordinator for 3 Audubon sanctuaries, on a bird walk at the Windham Path. On the walk we’ll identify, by sight and sound, the birds that call this important habitat home, as well as look for migrants passing through to their northern breeding territories. We’ll also talk about critters and plants that we encounter on the walk. Bring binoculars and water, and wear weather-appropriate clothing and footwear (no flip-flops please). This is a Schoharie Watershed Month event. Click here to view the event flyer. Join Diane Galusha, author of several books of regional history and president of the Historical Society of the Town of Middletown, for an illustrated talk of the New Deal's Civilian Conservation Corps. The CCC was created in 1933 by an Executive Order signed by newly-elected President Franklin D. Roosevelt. A federally-sponsored program for unemployed men from 17 to 25 years of age, its aim was to assist Depression-stricken families and at the same time conduct conservation projects to reverse decades of environmental degradation, improve public lands and develop parks, trails and campgrounds for public enjoyment. This talk is based on Galusha's book, Another Day, Another Dollar: The Civilian Conservation Corps in the Catskills, which was published in 2008 by Black Dome Press, formerly of Hensonville. The book features a Forward by noted environmental writer, scholar and activist Bill McKibben. Copies will be available for purchase. This is a Schoharie Watershed Month event. Click here to view the event flyer. Registration required by Wednesday, May 8th. Observations submitted by citizen scientists are playing an increasingly important role in tracking changes in species distributions and the overall biodiversity of our planet. If you already enjoy exploring the natural world or are looking for a new way to engage with it, then participating in the citizen scientist project iNaturalist may be for you. Join amateur naturalist and citizen scientist Xander Prince to learn how to use the iNaturalist mobile app to document your observations of flora and fauna. The workshop will begin with an overview of best practices and tips when using the iNaturalist app and website. Dan Snider will present on invasive plant species that are the greatest threat to the watershed and are found close to the Arboretum. Then we will move outside to explore and document the diverse plant and animal life at the Arboretum and load photos to iNaturalist. Registration not required. Call 518-589-3903 or visit the Mountain Top Arboretum events page for more information. Lecture from 1:00pm-2:00pm: Join Robert and Johanna Titus for a lecture on the glacial geology of the Schoharie Creek Valley. During the middle of the Ice Age, there was an advance of the ice that flooded the Schoharie Creek Valley. One mass of ice invaded from the east through Kaaterskill Clove, the other through Middleburgh. When all this ice melted away, a host of ice age landscape features were left behind. (Optional) Pratt Rock Hike from 2:15pm-4:00pm: Our hike up nearby Pratt Rock will allow us to see typical ice age features of the glaciation of the Schoharie Creek Valley. The ledge at the top of Pratt Rock has been planed off and striated by the passage of the ice. The valley below was once the floor of Glacial Lake Grand Gorge. Following the lecture at the Zadock Pratt Museum, hike participants will carpool to Pratt Rock. The hike is limited to 15 registered attendees. In the event of rain or other inclement weather, the hike will be postponed until Saturday, May 18th. This is an outdoor hike, so attendees should dress for the weather and wear appropriate footwear. This is a Schoharie Watershed Month event. Click here to view the event flyer. Registration required by Thursday, May 9th. Space limited. Registration includes option to sign-up for hike (this will be unavailable if hike has reached capacity). The hemlock woolly adelgid (HWA) is an invasive forest pest that threatens native eastern hemlock, a common tree species throughout New York and at the Arboretum. Hemlocks are a foundation species that create unique habitats and provide several ecosystem services including protecting clean water resources. The New York State Hemlock Initiative (NYSHI) integrates research, management, and outreach to address the growing threat of HWA in the state. NYSHI will share the importance of conserving hemlocks, the damage HWA is causing in our forests, and the management and community science efforts being employed to slow the spread of HWA in New York. We will finish the event by taking a short walk to the Arboretum's hemlock stand to scout for woolly adelgid. 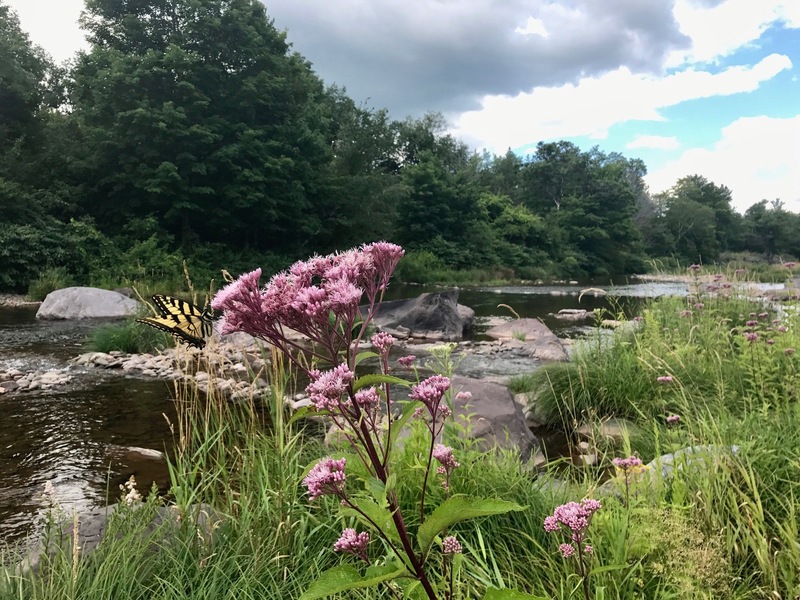 The CSBI program works with streamside landowners in the Schoharie watershed to plant native trees and shrubs in the riparian buffer area along the stream.Are you a streamside landowner with property located in the Schoharie watershed? Schoharie watershed landowners with property within a riparian buffer (streamside) area may be eligible to participate in the CSBI program. Participants of this program work with GCSWCD to develop a planting plan for native trees and flowering shrubs to be installed within the riparian buffer zone. Improved water quality: Riparian buffers serve as natural biofilters, protecting aquatic environments from polluted surface runoff. Riparian buffers reduce the amount of sediment flowing into streams by slowing surface water velocity and capturing sediment before it enters the stream. Riparian buffers reduce nutrients (i.e. nitrogen and phosphorous), pesticides, and other chemicals by slowing surface water velocity and allowing water to soak into the ground (infiltration) or be absorbed by the plants, which are able to naturally break down some of these pollutants. Increased habitat: Riparian buffers are extremely complex ecosystems that help provide optimum food and habitat for stream communities. The habitat provided by trees and shrubs also doubles as a corridor for species that have had their habitat fragmented by various land uses. Both aquatic and terrestrial species benefit from riparian buffers that have been protected or restored. The leaves and woody debris that fall into the stream provide food and habitat for even the tiniest of aquatic creatures, which are critical for the food chain. Stabilized streambanks: Native plants form extensive root systems that help hold the soil in place and slow the process of erosion. Water temperature control: By providing shade over the streams, trees and shrubs are able to help regulate the water temperature. They can even have a significant impact on moderating the effects of climate change on aquatic ecosystems, particularly in our headwater streams. Improved flood control: Riparian buffers encourage infiltration of stormwater by slowing the speed of the water running off the land and increasing the amount of water that is absorbed into the ground. Groundwater enters the stream at a much slower rate than surface water, which helps control flooding and maintain stream flow throughout the year.